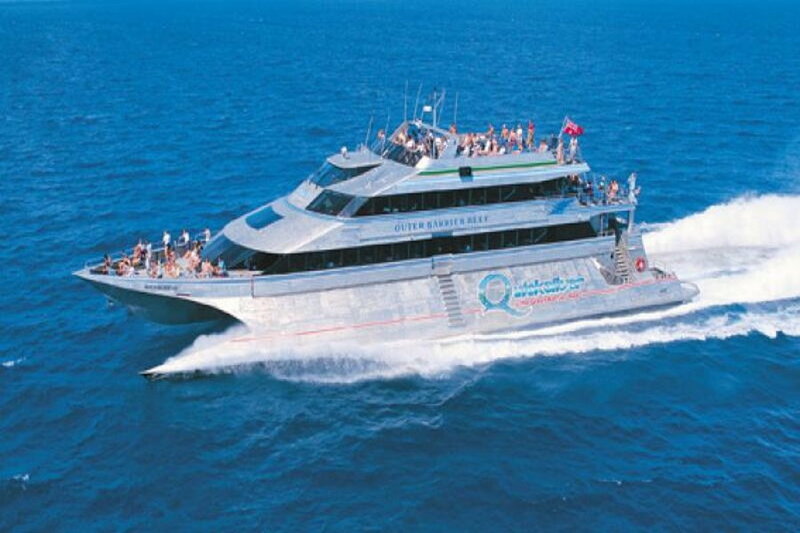 Jump on board Quicksilver's activity platform for a day of snorkelling, diving and fun! Located on the Agincourt Reef on the edge of Australia's Continental Shelf, Quicksilver's pontoon offers a fun day for the whole family to have explore the Great Barrier Reef, with something for everyone! Quicksilver's fun activity platform is a great place for the whole family to explore the stunning Agincourt Reef of the Outer Great Barrier Reef. With snorkelling, diving, a semi-submersible, ocean walking and an underwater observatory, you'll have a day full of activities in as many ways as possible. This trip is ideal for both swimmers and non-swimmers and has a fully attentive crew who will help you make the most of your time out on the reef. Fuel Surcharge: A fuel surcharge may be applicable and in such cases is payable direct on the day of travel. Definitely a staple to spending the day at the Quicksilver pontoon, snorkelling is a great way to explore the Great Barrier Reef. All of your equipment and tuition are included, and you will have a lifeguard keeping an eye out while you adventure around! If you want to learn as you explore, you can follow our marine biologist for a guided snorkelling adventure, where they'll point out all the marine life below, giving you an idea of what they are and how they play into this amazing ecosystem. Quicksilver offers a introductory snorkel tour of 30-40 minutes or an advanced snorkel tour for those who feel comfortable in the water, lasting up to an hour. Tours are subject to charge. See all the beauty of the reef up close without getting wet our semi-submersible boat. Cruise underneath the surface of the water for a surreal and immersive experience where you can see the reef lagoons and coral gardens while staying dry and enjoying the air conditioning. Tours depart every 15 minutes and viewings last around 25 minutes. Your tour and all commentary are included and you can go as many times as you like during the day! This unique way to check out the fish and marine life is great for the whole family. Watch fish (and scuba divers) swim past as they go about their daily lives, or stay tuned for a fish feeding show, conducted just above you on our unique viewing platform. Diving on the Great Barrier Reef is an experience like no other! We offer both introductory and certified diving so all types of divers can enjoy the Agincourt Reef. With generally good visibility and exceptional marine life, it's a divers paradise. Dives are subject to charge. Experience the feeling of diving without having to get geared up! With ocean walking, you'll wear a astronaut-like helmet and breath normally as you walk on the ocean floor, keeping your hair and face out of the water completely! This unique experience is suitable for non-swimmers who with to have a below-the-sea experience without all the fuss! Subject to charge. 10:30am - Our crew will brief you on the day as well as show you the ropes for a day full of snorkelling. Divers will also be briefed on what's to follow during their days activities. Top it off with a presentation on the marine life in the area. 12-1:30pm - A hot and cold tropical lunch is served on board, buffet style. With fresh prawns, pastas, meats, salads and fruit, you'll have an amazing lunch before heading back out for activities! All cancellations made result in 25% cancellation fee of the total price. Any cancellations made 60-30 days prior to travel will result in a 50% cancellation fee and any cancellations made inside of 30 days to departure will result in forfeit of full trip fees. If the sailing company has to cancel the trip (prior to the boat's departure) and we cannot offer a suitable alternative, then a refund will be given minus card fees. We strongly recommend that you have travel insurance, especially during the wet season.